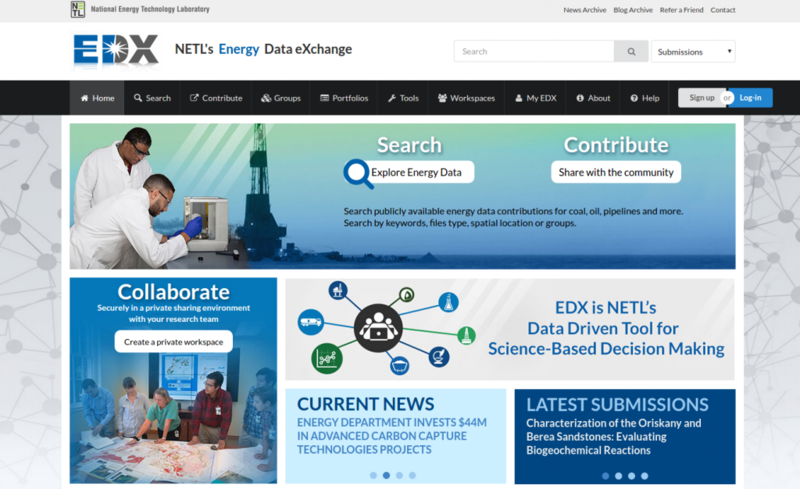 The Energy Data eXchange (EDX) is a web-based application for internal coordination, outreach, collaboration, and tech transfer of National Energy Technology Laboratory (NETL) Department of Energy (DOE) fossil energy products. The innovative solution builds upon Open Knowledge Foundation’s open source Comprehensive Knowledge Archive Network (CKAN) to create a streamlined data techno-economic-chemical-design-technology-improvement system with spatial and contextual searching; analytical, mapping, and reporting tools; file sharing, and community ratings. EDX’s nodal capabilities enable sharing with other CKAN based sites such as data.gov and geothermaldata.org. EDX provides internal access to research that crosscuts multiple NETL projects/programs, and external access to technical products and data published by NETL research teams. In this role, EDX facilitates coordination of both restricted-access and open-access research data. NETL-affiliated researchers can use EDX’s collaborative workspaces to coordinate and share work with a variety of organizations and institutions in a secure environment. EDX offers online tools to disseminate data, information, and results from DOE’s Fossil Energy intramural research portfolios (e.g., the DOE EPAct Complementary Program, CO2Storage Program, National Risk Assessment Partnership (NRAP), National Methane Hydrates Program, etc. ).